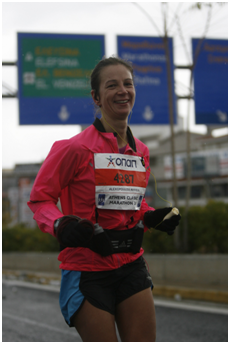 It’s now a week and a day since I ran my second Athens Marathon and here are my thoughts and memories, a recap of what happened in the built up to the race as well as during it. I did all my long runs, I ticked all the boxes but by Monday night on the week of the marathon I got hit by the dreaded sore throat that by Wednesday had developed into a full blown cold. I was frustrated and sad and could not picture myself taking part in this beautiful event. What a shame… Nonetheless, I might be ok, there were still a few days to go and I was consuming lots of vitamins. So I packed my lightest running outfit that I had planned on wearing ever since last year’s 25oC temperatures and off we went, me and my long suffering husband to arrive in Athens late on Friday evening. It was cold and there were gale force winds. But my dad reassured me they would not be against us. Luckily I had had a look at the weather forecast and at least had brought my gloves with me! Saturday came and I felt ok. 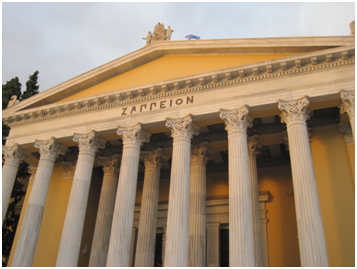 I went to collect my racing number, timing chip and t-shirt from Zappeion, a beautiful neoclassical building near the stadium where the marathon finishes. Proudly I activated my timing chip and saw my name on the screen. It was all starting! Back at home I dutifully ate my pasta and tried to relax. Alas, one of my mum’s cats arrived around 10pm with a massive injury on her leg. As my dad had decided to register to the race last minute as he felt like running a half (not an official option, he would just stop at 13 miles), my mum and husband (as I said long suffering) had to take Rosa to hospital. Of course us runners stayed home watching TV and resting our legs. By 1am they were back with good news about the cat, phew! About 3 hours of sleep later, it was 6am on the morning of the race. Me and my dad were driven to Marathon and were left there just before 8am so that our fans could escape before the road closed. It was cold and windy and we were given plastic bags to wear to keep warm. We then tried to decide how many layers of clothes to keep on and how many to put in the bag that would be reunited with us at the finish. I have to say I am grateful I was not alone. Time went fast and soon we had to go to our starting blocks. We kissed and wished each other good luck and we were off! My legs felt good and there were no signs of weakness due to my cold. I knew I hadn’t completely lost my speed during this year’s preparation so I decided to run at a reasonable pace where I could, to make up for the time that I would waste on the hilly bits. I passed 10k at a reasonable time and reached the half point in 1h58, despite the serious undulations up to that point. By mile 14 though, things started to change. I had to slow down and eventually stop and walk as it felt like my legs had been left somewhere at the half point. I couldn’t really understand why I was finding it so hard. 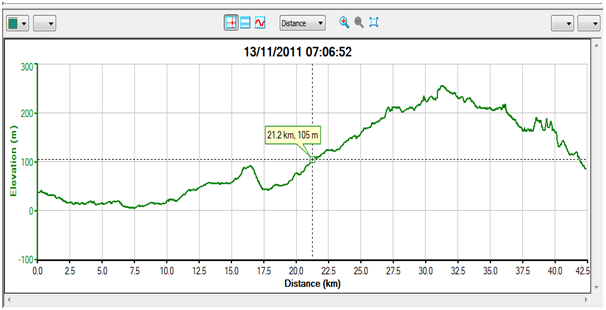 However, if you have a look at the elevation chart my Garmin recorded perhaps you will see why. Thankfully, David was waiting for me at 17 miles so I had a little break there. An old man that was leaving the local coffee shop suggested I went inside to warm up. I wish, I thought! So off I went as well as I could and headed towards Athens. All along the way and despite the miserable conditions there were lots of people cheering us on, some offering us an olive branch. I smiled, waved and thanked them for their generosity. After a point the downhill section of the race begins (around mile 20) which is more than welcome. At mile 22 I looked out for my fans but they were not there, so I decided to step on the side of the road and call them. As I could not get through I reached my mum who was organising the whole operation from home and who thought I had given up. When I said I hadn’t she could not quite understand why I was calling her for a chat. A mile or so further down under a bridge, a band of guys with timpani was playing announcing our entrance into the city of Athens. My ipod was silenced for a few seconds and I felt the beat in my whole body. I waved to them and pressed on well into my beloved city. We turned left into the main road, 2 more miles to go. It seemed so long. But finally, the realisation that I was going to make it was taking over. Going past the last refuelling stop, I grab a drink while the volunteers say congratulations. I am so grateful to them. I am still worried though that even though I am so close something might still go wrong. I turn right at the corner of the Hilton hotel into Vassilissis Sofias street. I know this road, I grew up here. How come I never realised it was so long! I pass Rigillis street, I know the little church of St Nicholas is hidden in the little park there, I cross myself. I make the last turn into the grand road of Irodou Attikou. More memories there. I take my headphones off to listen. 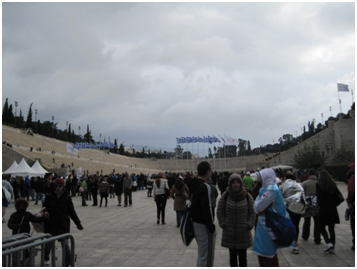 I can see the Panathenaiko stadium simple and glorious. I am humbled by the fact I am allowed in. Just before I enter the stadium I see my father waving and David concentrating on taking good pictures. I wave and all the pain is gone. I enter the stadium with a loud bang as I step on the metal plate they have to even out a step. I sprint to the finish. I finish in 4h20min, a whole 18 minutes faster than last year. The race is extremely well organised. There are a large number of volunteers with a smile on their faces that make sure that everything goes smoothly from the moment you get your racing pack, to the many refuelling stations (water, Gatorade, bananas, cookies, wet sponges), the vans that take your bag from the starting point and give it back to you at the end (they seem to find it in seconds) and the first aiders that spray your legs with deep-heat. The medal is beautiful and the finish humbling. It is a tough but honest race and I think I now know what I need to do to tackle it a bit better next time. Someone wrote on the marathon wall that it felt as if the ancient spirits were running with us that day. It certainly felt that way. The race of a lifetime. ← Mumbai Marathon 15 Jan 2012 anyone?